Stars form from dense clumps of molecular gas deep inside a cloud. The clumps shrink down until their centers become hot enough (around 10 million degrees) for hydrogen to fuse together. At that point, the energy generated by fusion pushes their outer layers outwards and halts the contraction. The delicate balance between gravity and gas pressure continues as long as there is hydrogen to fuse in the core. During this long, hydrogen-burning phase of their lives, stars fall on the main sequence of an HR diagram. How long does a star continue to fuse hydrogen? What happens when it runs out of hydrogen in its core? 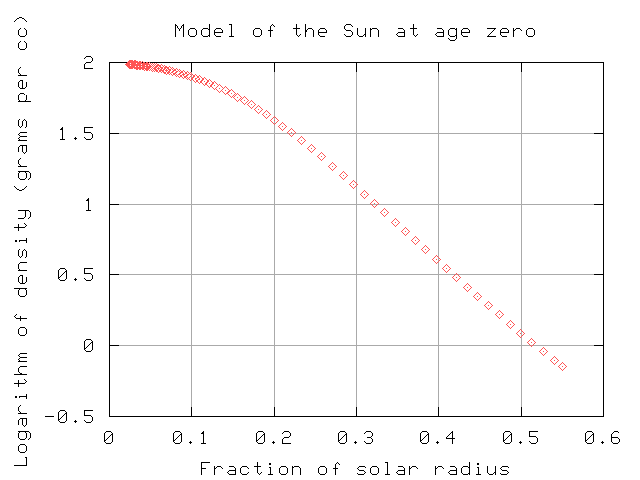 The luminosity of the Sun is about 4 x 10^(27) Joules per second. Each time four protons fuse together to form one helium nucleus, a total of 4.3 x 10^(-12) Joules are released. How many reactions must occur each second? How many kilograms of hydrogen are involved in one reaction? How many kilograms of hydrogen are used each second? 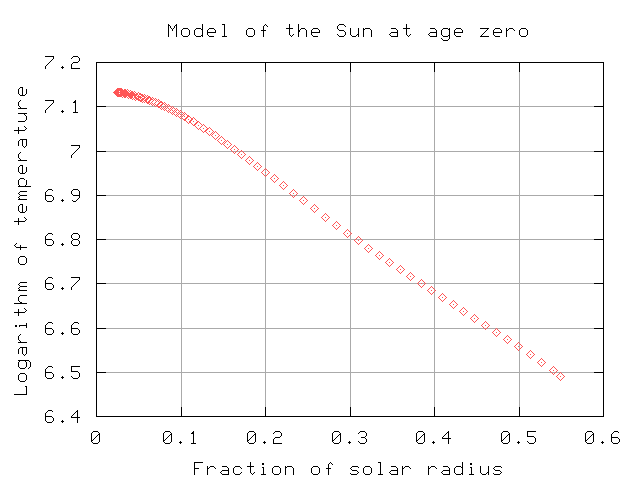 The mass of the Sun is about 2 x 10^(30) kg. How many seconds will it take to fuse all the hydrogen? Seems like a long time, doesn't it? How does it compare to the age of the Solar System? Are we in danger of waking up tomorrow to find out that the Sun has stopped shining? Our estimate involves several simplifications. To do the job right, one needs to build a model of a star mathematically. Most models break the star up into a series of thin spherical shells. Back in the old days, astronomers had to work through all the equations in all the different shells by hand; it took a LONG time, and was extremely boring. Fortunately, we can now just write a computer program to do all the dirty work, and look at the results. Some astronomers have even made it possible for you to run their programs via the Web! The Stellar Interior Construction Site lets you look in detail at the interior of a star which has just been born: a Zero-Age Main Sequence star. Thanks to Michael Briley of University of Wisconsin at Oshkosh, who has a number of simulation tools for you to play with. to run the CNO cycle? Hey -- check out the density of the shell about halfway out to the edge of the Sun. would it float or sink? Okay, so one can make a model which shows the structure of a star when it starts to fuse hydrogen in its core. That's good. But you can also use stellar models to watch the star's properties evolve with time. As time goes by, the innermost regions of a star's core change from mostly hydrogen to mostly helium, which changes the rate at which energy is produced. A whole series of changes ripple outwards through the stellar model as the interior becomes more and more helium rich. We can't see these changes within the interior of other stars directly, but we can observe the photosphere's temperature and the overall luminosity. Lots of movies showing stellar evolution from the Digital Demo Room Stellar Structure and Evolution Simulator. you will receive a detailed listing of the properties of a bunch of stars, ranging in mass from 0.1 to 7.0 solar masses, at an age of 1.0e9 = one billion years. The second table is labelled "Additional Information." to fuse hydrogen for at least one billion years? You can use this formula to estimate the length of time that a star will remain on the main sequence. remain on the main sequence? Why do the most massive star die so soon? Because they use up their fuel much more rapidly than their low-mass cousins. This movie compares the evolution of a high-mass star (15 solar masses) to a low-mass (3 solar masses) star. have at the start of its life? Q:  What is the luminosity of the high-mass star? What is the luminosity of the low-mass star? you'll see that there really aren't many stars at the high-mass end. Aha! And that's just what the stellar models predict: the high-mass stars burn through their hydrogen very quickly, so they don't stick around for long. Now, if you look at the low-mass end of the main sequence, you also see relatively few points. Astronomers believe that low-mass stars are actually formed more frequently than stars like the Sun, and (as you've just seen) they should last a long, long time. So why are there so few observed low-mass stars? Lionel Siess at the Institute of Astronomy and Astrophysics at the Université Libre de Bruxelles in Belgium has a form which lets you examine stars of various ages. Just go to his website and browse the many tools! The Stellar Structure and Evolution Simulator section of the Digital Demo Room gives you background information on stellar evolution, movies of stars moving through the HR diagram, and even lets you create your own movies. Bill Paxton's Library of EZ Star Plots provide many examples of stars moving through the HR diagram as they age. Bill's EZ software package, available on his home page, lets you follow the evolution of stars on your own computer. The Stellar Interior Construction Site lets you look in detail at the interior of a star which has just been born: a Zero-Age Main Sequence star. Thanks to Michael Briley of University of Wisconsin at Oshkosh.